Neuroscientist Bradley Voytek discusses how brain damage and neurosurgery can be windows into the functioning of the mind in an engaging TEDxBerkeley talk. As well as being remarkably well-explained, the talk has a personal current running through it as Voytek reflects on his own motivations for becoming involved in brain research after experiencing his grandfather suffering the effects of Parkinson’s disease. Understanding brain damage is still one of the most powerful tools in cognitive science and this is a great introduction to how researchers go about making the leap from damaged tissue to psychology. If you’ve got 20 minutes to spare and are interested in the links between neuropsychology and human nature, you’d do well to spend them here. Great stuff. Link to Bradley Voytek TEDxBerkeley talk. I’ve just picked up on this thought-provoking 2008 article from the Boston Globe on a psychological theory of poverty that suggests that traditional economic models just don’t apply to the poor. The article riffs on an apparently under-recognised book by philosopher Charles Karelis called The Persistence of Poverty: Why the Economics of the Well-off Can’t Help the Poor. Karelis, a professor at George Washington University, has a simpler but far more radical argument to make: traditional economics just doesn’t apply to the poor. When we’re poor, Karelis argues, our economic worldview is shaped by deprivation, and we see the world around us not in terms of goods to be consumed but as problems to be alleviated. This is where the bee stings come in: A person with one bee sting is highly motivated to get it treated. But a person with multiple bee stings does not have much incentive to get one sting treated, because the others will still throb. The more of a painful or undesirable thing one has (i.e. the poorer one is) the less likely one is to do anything about any one problem. Poverty is less a matter of having few goods than having lots of problems. I also a found a short piece on NPR where Karelis discusses the idea further and I was thinking that as an essentially psychological theory, the general idea must have been tested before. However, I’m having trouble finding anything directly relevant, although I’m certainly not an expert in the area so maybe I’m looking in the wrong places. Link to Boston Globe article ‘The sting of poverty’. Stanford Magazine has a fascinating article on how speakers of different languages think differently about the world. The piece focuses on the work of psychologist Lera Boroditsky and covers many of her completely intriguing studies about how the conceptual tools embedded within languages shape how we think. 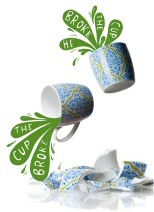 “In English,” she says, moving her hand toward the cup, “if I knock this cup off the table, even accidentally, you would likely say, ‘She broke the cup. '” However, in Japanese or Spanish, she explains, intent matters. She has shown that speakers of languages that use “non-agentive” verb forms‚Äîthose that don’t indicate an animate actor‚Äîare less likely to remember who was involved in an incident. In one experiment [pdf], native Spanish speakers are shown videos of several kinds of acts that can be classified as either accidental or intentional, such as an egg breaking or paper tearing. In one, for example, a man sitting at a table clearly and deliberately sticks a pin into the balloon. In another variation, the same man moves his hand toward the balloon and appears surprised when it pops. The Spanish speakers tend to remember the person who deliberately punctured the balloon, but they do not as easily recall the person who witnesses the pop but did not deliberately cause it. English speakers tend to remember the individual in both the videos equally; they don’t pay more or less attention based on the intention of the person in the video. The article has an element of Stanford University blowing their own trumpet, but it is also full of delightful examples of how language and understanding interact. The piece discusses the work in terms of the Sapir-Whorf Hypothesis, which originally claimed that language categories reflected or constrained the categories of the mind but is generally used more widely to suggest that people think differently about concepts in different languages. Not being a linguist, I never understood why this idea was controversial in the first place, as it seems obvious to me that people are limited or enabled by the conceptual tools available to them through language. The irony that psychology itself seems limited by the conceptual language of computation seems to have been widely missed by all concerned. Link to ‘You Say Up, I Say Yesterday’. Frontiers in Neuroscience has an amazing scientific article that has collected all the studies that have recorded what happens when the brain is electrically stimulated in living patients. It’s like a travel guide to the unnaturally active brain. As you might expect, science generally takes a dim view of researchers cracking open people’s skulls just to see what happens when bits of their brain are stimulated, hence, almost all of these studies have been done on patients who are undergoing brain surgery but have agreed to spend a few minutes during the operation to report their experiences for the benefit of neuroscience. This procedure is also essential in some forms of brain surgery to make sure the surgeons avoid essential areas. For example, in some cases of otherwise untreatable epilepsy the surgeons track down the ‘foci’ or trigger area, and can often stop seizures completely just by removing it. However, if an area is heavily involved in speech production, you wouldn’t necessarily want to give up being able to talk for the sake of being seizure free, so surgeons will open the skull, wake you up, and then ask you to speak while stimulating the areas they are considering removing. They can map your speech areas by seeing when you can’t speak as the areas are stimulated, and hence, know what areas to avoid. So through years of experimental and clinical studies we now have what amounts to a travelogue of what happens when brain areas are stimulated. Neuroscientists Aslihan Selimbeyoglu and Josef Parvizi have compiled these reports into something like a cortical guidebook. Stimulations in the anterior medial temporal structures were associated with complex feelings and illusions such as feeling of unreality or familiarity (d√©j√† vu) or illusion of dream-like state; emotional feelings such as feeling of loneliness, fear, urge to cry, anger, anxiety, levitation, or lightness; and recall of past experiences. Stimulations in the superior temporal structures were associated with hallucinations in the auditory domain such as hearing ‚Äúwater dripping‚Äù, ‚Äúhammer and nail‚Äù, music, or human voices, or changes in the quality of auditory stimuli such as muffling of environment. If stimulations of the superior temporal region were in the depth of the sylvian fissure, and toward the insula, stimulations induced pain or automatisms such as sudden movement, staring, unresponsiveness, plucking, or chewing. Stimulations in the inferior and middle temporal and temporooccipital structures were associated with hallucinations in the visual domain such as seeing a face, geometric shapes, and color or blurring of vision, macropsia, visual movement, things looking sideways, and lines seeming out of kilter. In addition, disruption in reading, or reading comprehension, picture naming and or identification were also reported with left inferior temporal lobe stimulations. Laughter with a sensation of mirth was associated with stimulation of the left inferior temporal region in the vicinity of the parahippocampal gyrus. The article is open-access so you can read the full details online. Link to ‘Electrical stimulation of the human brain’. Link to so-so Wikipedia page on ‘When Prophecy Fails’. The successes of the South American teams in the World Cup have led to some speculation that years of street football may be responsible for the fast paced dexterity that powers the Latino players. 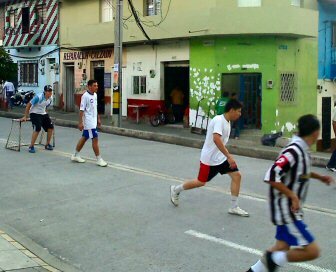 The photo is of some lads playing street football in the Manrique barrio of Medell√≠n, Colombia. I took the photo a couple of days ago and it depicts the typical type of informal football that happens in residential streets across the continent. The game is a great way of developing ball skills as the play is fast paced, the space limited, and the ‘field’ often interrupted by a passing motorbike or pedestrian which the players are just expected to work around. It’s clearly a game which demands quick thinking and improvisation. But I want you to focus on the left hand side, where you can see the goal. It’s tiny. It’s about a metre wide, about the same high, and the goalie can virtually fill it if he crouches. This is the standard street football setup here. In these games, much of the skill in scoring goals relies on a combination of fooling the keeper, by tempting him out, followed up with pinpoint accuracy in targeting any small angle which subsequently appears. However, there’s some evidence from sports psychology which may give us another clue as to why this is useful preparation for more formal football matches: experiments have shown that if you’re playing badly the goal is perceived to be smaller than it actually is. It’s probably worth pointing out that, as far as I know, this has never been tested specifically in football, but it has been shown in various other sports. It was found that participants who made 3 or more successful kicks perceived the goal to be bigger than it actually was, whereas those who scored 2 or less goals perceived it to be smaller. There was also a relationship between the subsequent perception of the goal posts and how the kicks were missed: participants who more frequently kicked the ball to the left or right of the target perceived the upright posts to be narrower, whereas those whose kicks tended to fall short of the goal, or to be too low, perceived the crossbar to be higher. So, if you’ll excuse the punditry for a moment, I wonder whether one of the benefits of street football is that players have informal training of dealing with small goal sizes. In other words, as well being useful training for ball skills, it also helps adapt to any perceptual changes that occur during the match. Link to Neurophilosophy on performance and goal size. ABC Radio National’s All in the Mind has a fantastic programme that looks back on how amnesic Patient HM was central to our understanding of human memory and how the study his post-mortem brain will continue to illuminate the neuroscience of remembering. HM became densely amnesic after experimental neurosurgery was performed to treat his otherwise untreatable epilepsy. His case has been very well covered over the years, especially since he died in 2008, but this edition of All in the Mind talks to some of the world’s leading memory researchers to discuss his scientific legacy. Also, don’t miss the audio extras on the AITM blog which probably add up to another programme’s worth of material and goes into more depth on the implications for cognitive science. Link to All in the Mind on HM. Link to extras on the All in the Mind blog.